Long lines formed at banks across India today, following Prime Minister Narendra Modi’s announcement on Wednesday of a bold measure to reduce the role of unaccounted for cash or “black money” in the country’s economy by “de-monetizing” higher-denomination currency notes. The new policy, which became effective at midnight on November 9 after a short four-hour notice, bans the use of 500 rupee and 1,000 rupee currency notes (worth approximately $7.50 and $15, respectively) and requires holders of these notes to either deposit them with banks or exchange them for smaller denomination notes by December 30. More details of the plan can be found here and here. The measure reflects growing concern that high denomination currency notes are often used to conduct illicit finance—including money laundering, tax evasion, and terrorist financing—because they allow for large and anonymous payments. For this reason, thought leaders including former Standard Chartered CEO Peter Sands and CGD’s Board Chair Larry Summers have argued that policymakers should eliminate high value currency notes such as the $100 bill, and in May 2016 the European Central Bank eliminated the €500 note. Kenneth Rogoff has taken the argument a step further by suggesting the elimination of cash altogether. Interestingly though, the Indian government has already committed to printing new higher denomination notes (including Rs.500 and, for the first time, Rs.2,000 notes) at the beginning of the next financial year (April 1, 2017). These new notes will have security features that make counterfeiting more difficult. This makes it clear that the government’s strategy is to flush the system of counterfeit and black money rather than remove higher denomination notes. For the time being though, the Rs.100 note (worth approximately $1.50) will be the highest denomination note in the Indian economy. While this measure may have the positive (though potentially temporary) effect of forcing illicit activity out of the regulated economy, the process could be disorderly, with the poorest members of society bearing the brunt of the disruption. 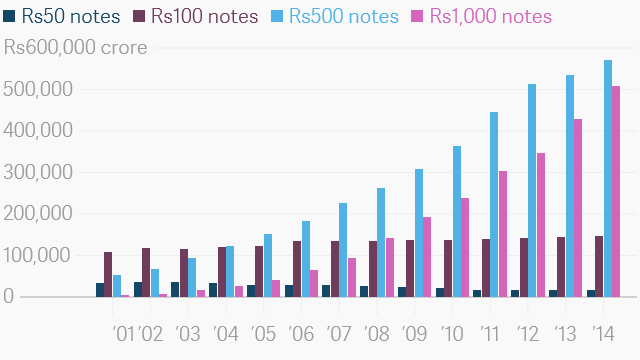 All banks in India were closed yesterday, so they could restock their ATMs with small denomination notes. With banks now reopened, Indians now have 50 days to deposit their Rs.500 and Rs.1,000 notes or exchange them with notes of smaller denominations. An ATM withdrawal limit of Rs.2,000 will be in place until November 18, at which point it will be raised to Rs.4,000. The measure will eliminate, for a time, the use of counterfeit notes in these denominations. It will also present a stark choice to those who have used these notes to hoard black money: either convert their funds into “white” (or legal) money that can then be taxed, or lose the wealth stored in these denominations. The Ministry of Finance has already called on banks to keep records of new deposits and exchanges, which will presumably deter individuals who raised these funds illicitly from seeking to deposit or exchange them. About 80 percent of cash in India is held in Rs.500 or Rs.1,000 denominations; therefore the strict limits on withdrawal and exchange will be a cause of concern for the common person. When we consider that GDP per capita in India was $1,456 in 2013, while GDP per capita in the United States was $52,660, and adjust for this difference in income, we find that the Rs.500 note represents roughly the same share of an average Indian’s income that a fictional $300 bill would represent to the average US person. With some policymakers in the United States considering eliminating the $100 bill, it is not outlandish for the Indian government, using the same logic, to consider eliminating bills worth Rs.500 or more. However, the negative effect on poor households of such a ban may be significantly higher in India, given the economy’s heavy reliance on cash: the total value of cash in circulation in India is approximately 12 percent of GDP compared to 7 percent of GDP in the United States. 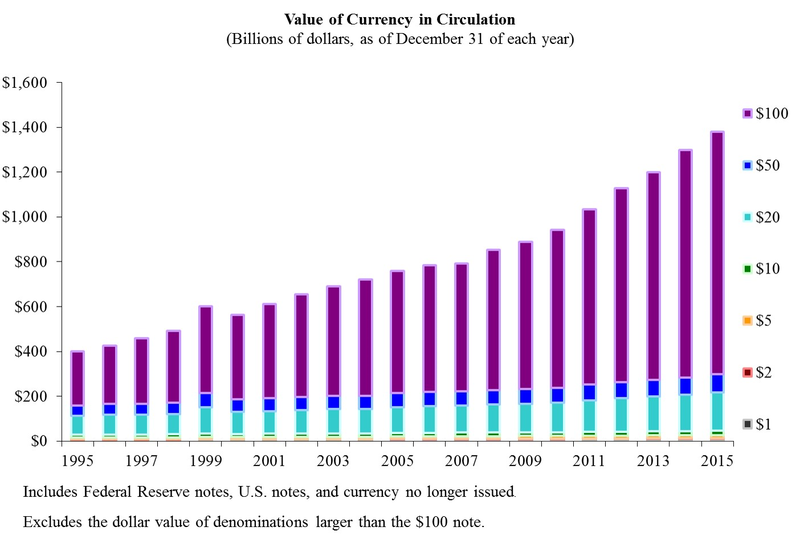 Indeed, the value of the banned notes represents more than 10 percent of India’s GDP, whereas the total value of $100 bills in the United States is equivalent to 5 percent of US GDP (the relative importance of higher denomination rupee notes to India’s domestic economy is actually much greater, since roughly two thirds of all $100 bills are held outside the United States, often as a reserve currency, according to the Federal Reserve). In addition, since the smooth transition towards the new notes relies on access to banks, those who lack this access are at the highest risk of running out of cash. Prime Minister Modi has promised that the government will mitigate the short-term repercussions of the plan by allowing firms to accept Rs.500 and Rs.1000 notes in cases of emergency, including at government hospitals, pharmacies, and booking counters for railway or bus tickets. However, there are plenty of reasons to be concerned about how this surprise move will affect India’s poorest citizens. Whether these measures can significantly reduce illicit finance and tax evasion in India without negatively affecting the country’s poorest will depend on how well the Indian government, and particularly the Reserve Bank of India, manage the process over the next 50 days. The government should be commended for its boldness but it should also recognize that this is merely one step towards reducing the role of cash in the economy and moving to a more modern financial system that relies more heavily on digital payments.